Please read this text before you request a Dr.Web CureNet! trial. Dr.Web CureNet! is a remote centralised curing tool for PCs and servers running MS Windows 2000/XP Professional /2003/Vista/2008/Windows 7 (32- and 64-bit), including those running different anti-virus software, regardless of local network size. Scanners can be uploaded from any removable media, including USB and iPhone/iPod touch. Find out more. Dr.Web CureNet! DOES NOT PROVIDE resident end-point security. When the solution isn't scanning computers, any malicious program can infect them. 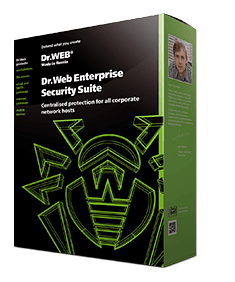 To protect all the hosts in a corporate network, use Dr.Web Enterprise Security Suite. You must have administrator privileges on the applicable PCs and servers to scan your network with Dr.Web CureNet!. Remote scanning does not require any additional configuration of your computers provided that they are members of a domain and a domain administrator account is used on them. If a remote computer is not a domain member or a local account is used, for some versions of Windows remote computers require additional configuration. Learn how to configure a network by reading step-by-step instructions or watching a video tutorial. Changing settings on a remote machine for scanning purposes can make it less secure. Therefore, before making any configuration changes, we recommend that you learn how they will affect system operation. You may also choose to not make use of remote scanning and scan a target computer locally. The Dr.Web CureNet! trial doesn't feature curing. In the trial mode, you can only monitor how scanning processes are distributed between computers in the local network, scan machines, and receive a report about detected (but not cured) viruses and malicious programs. To cure a network PC, buy a commercial license. When a serial number for the Dr.Web CureNet! trial version is sent to a user, the number is already registered (it becomes active as soon as a trial is requested). Need a comprehensive anti-virus solution for your corporate network?